A recent study of 22,000 publicly traded companies found a correlation between profitability and women in leadership roles. Specifically, when companies increased leadership positions for women from 0% to 30%, profitability increased by 15%. In the private technology sector, it was found that women-led companies were not only more efficient, but also brought in a 35% higher return on investment. But statistics also show that the business world has yet to fully bridge the benefits of women in leadership roles with actual participation and investment. Recent data showed that less than 2% of all venture capital goes to female founders and fewer than 8% of investors are women. And even though American, women-owned businesses represent 28% of American enterprises – while employing 7.7 million people – in the publicly-traded sphere women only hold 5% of CEO positions at S&P 500 companies. Prominent investors and investment banks like Goldman Sachs are seeing the disconnect and seizing the opportunity. Goldman will invest $500 million into companies led, founded or owned by women, which is a program that appears to be an extension of their 10,000 Women Initiative, launched in 2008 with an annual $100 million commitment to “providing business and management education for women-owned small businesses in developing countries. The tide is shifting – in the last 15 years, US female-run businesses have increased by 54%, and it appears that the trend is not reversing any time soon. What is the Investment Implication of this Trend in Business? The point of this piece is not to say that investors should go out and build a portfolio of only women-led businesses. But it is to say that investors looking to diversify have a range of new possibilities to explore – possibilities that extend beyond domestic vs. foreign, small vs. large, value vs. growth. Just as investors can now seek out companies that embody certain values or meet certain criteria – such as limiting environmental impact or having high health and safety standards – so too can they seek out companies led by women. How Can You Add Women-Led Businesses to Your Portfolio Right Now? 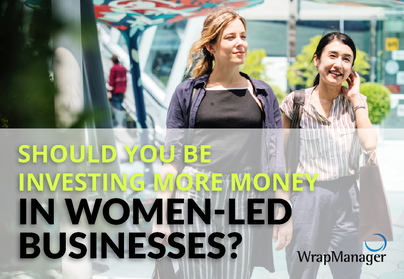 If the rationale for investing in women-led businesses is compelling to you, there are innovative ways to integrate them as part of your overall portfolio. WrapManager proudly offers gender diversity investment opportunities as part of the SAIRSHA Global All Cap ESG portfolio. Curious to learn more about what an ESG investment is? Check out our primer on ESG investing here. If women-led businesses are an investment category you’re seeking out or are interested in learning more about, call a Wealth Manager today to discuss. We can talk with you about how to customize portfolios for criteria that is important to you and/or meets your needs. Call us today at 1-800-541-7774 or start the conversation over email at wealth@wrapmanager.com.